Now this is a good interactive map. DesMoiesRegister has put together a map charting the damage done by the tornado that wiped out the southern third of Parkersburg, Iowa, earlier this year. Aside from being able to zoom and pan round the town, clicking on a property to see the before and after photos of the buildings the map makes use of a series of filters and overlays that allows users to specify the amount of information they want in view at any one time. 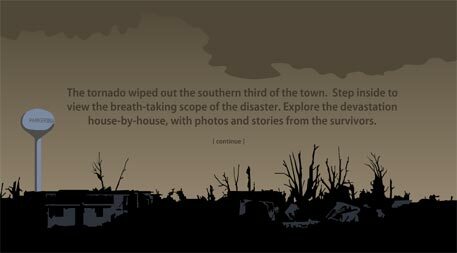 Filters include a colour-coded display of damage to buildings, locations of fatalities, aerial photo markers, the location of stories and videos captured on the ground and a filter that lets you overlay satellite photographs taken days after the event. 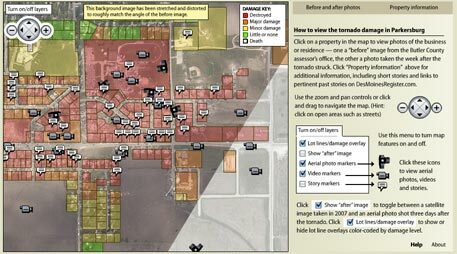 This entry was posted in Online Journalism and tagged Iowa, Mapping, Parkersburg, satellite photographs on June 27, 2008 by Oliver Luft.